Meghalaya Chief Minister Conrad K Sangma was left red faced on Monday at a function commemorating the 47th statehood day of the state. Conrad, who had his studies in Imperial College in London and the Wharton School of the University of Pennsylvania, a business school in Philadelphia had a major embarrassment during the launching of WhatsApp-based Public Grievances Redress Mechanism in Shillong on Monday. The banner read the word ‘public’ as ‘pubic’ in the backdrop put up at the dais of the venue – a blatant case of carelessness and oversight on the part of those responsible public servants. The faux pas that took place during a programme of none other than Meghalaya CM Conrad K Sangma on Monday has raised eyebrows of all. The spelling error was noticed on the display board prepared for the launching of the Chief Minister’s WhatsApp-based Public grievances Redress Mechanism on Monday. Everything went well. Meghalaya Chief Minister Conrad K Sangma came and launched the WhatsApp-based Public Grievances Redress Mechanism in presence of media persons and officials of the State secretariat in Shillong. The error came to the notice of some of the media persons present in the programme later when they checked pictures clicked on the occasion for uploading the same along with the new report. 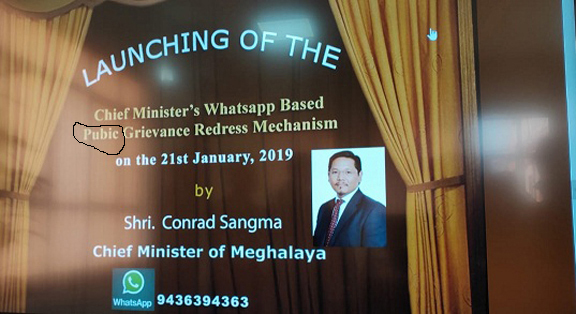 On the display board, prior to the launch of the platform, it was written as: “LAUNCHING OF THE Chief Minister’s Whatsapp Based Pubic Grievances Redress Mechanism on the 21stJanuary, 2019 by Shri Conrad Sangma Chief Minister of Meghalaya”. Instead of ‘pubic’ it should have written as ‘public’. The act of the official who was responsible for preparing the display board would definitely embarrass the Chief Minister of a State where English is the official language. Meghalaya CM Conrad Sangma launched the CM’s WhatsApp platform for public grievance redress on the occasion of the 47th Statehood day. Now, people can submit their grievances directly to the Chief Minister’s office through this platform. The Meghalaya CM launched the platform at his office chamber in the main secretariat.